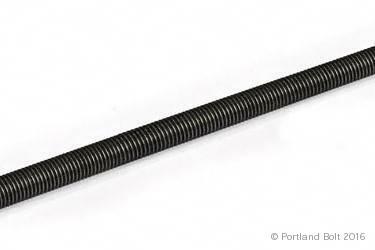 All thread rod, commonly referred to as fully threaded rod, redi-rod, continuously threaded rod, TFL rod, and abbreviated ATR is used for general purpose fastening for anything from an anchor bolt to a through bolt. A variety of grades and materials are available. 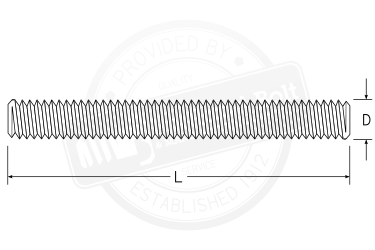 Portland Bolt’s stock all thread rod is domestically manufactured and includes chemical and physical test reports. Stock grades are indicated by part number below in black text. Red part numbers indicate all thread rod that can be made to order but is not stocked. All grades of stock all thread rod can be shipped in 6’, 10’, or 12’ lengths, or cut to length prior to shipping. All thread that is cut to length is chamfered, stamped or color coded for grade identification when necessary, and galvanized when necessary. Although stainless steel grades are not listed, they are readily available in the marketplace and can be provided. * ASTM A36 is a steel grade, not a fastener specification. Technically, all thread rod made from A36 steel should be ordered to a fastener specification such as A307 Grade A, A307 Grade B, or F1554 Grade 36. The appropriate fastener specification will depend on the application. However, Portland Bolt stocks all thread rod manufactured from A36 steel and can certify it as such upon request. Learn more about ordering fasteners to A36 in this FAQ. 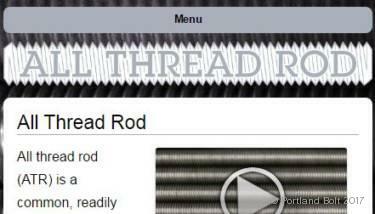 Learn more about all thread rod on our specialized microsite.